Look, we are big fans of the JC boys and understand over time they need to evolve as a pop band. However after viewing their latest video for their new single, the boys seems to be becoming a shadow of their former coolness. Gone are edgy beats, gone is the cheekiness that melted ours and their fans hearts, and gone are the DANCE MOVES, which is just plane cray cray. 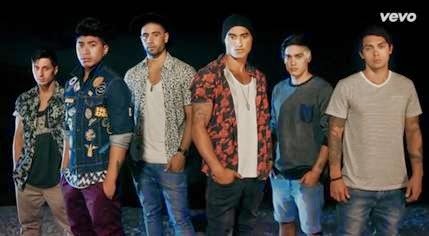 We are not saying Rise & Fall isn't an ok track, and the video see's the boys hanging out with a bunch of girls on the beach and it's pursuing the romantic side of the band, blah blah blah, however we missing the old school Justice Crew. We hope when they drop their new album later this month we'll have some of the JC coolness back that we love. They even don't look happy themselves in the picture above. Rise & Fall is available on iTunes now..!